Gerry Looman, IFH Group Inc.
Are effective lubricant storage and handling practices important to facilities? Unequivocally, yes. Well-designed systems have made it possible for companies not only to realize a return on investment in a short period of time, but also to save thousands of dollars per year in maintenance-related expenditures. The facilities manager who fails to closely scrutinize his or her lubricant storage and handling practices is missing a big opportunity to increase the bottom-line profitability of the company. What types of lubricants are in use? How much of each is consumed? Has consolidation been considered? Are there several lubricants being used that meet the same specification? Is the environment where the lubricants are stored particularly aggressive (does it corrode or rust metal aggressively)? How much of each type of lubricant is used in any area, and are the areas close enough that a single storage area is efficient? Are the lubricants in use purchased in the appropriate quantities (small containers, 55-gallon drums or bulk)? Are the lubricants susceptible to separation during storage? Are the lubricants susceptible to cold oxidation during storage? Does the current placement of product create inefficiencies? Do the current methods maximize or ignore cleanliness? Are the lubrication technicians subjected to needless physical risks in the handling and delivery of lubricants? Do the policies in place help or hinder the program and the attitude of the employees? It is the job of the maintenance supervisor to know how the environment, handling and storage methods influence the lubrication program viability. The typical approaches to storing and dispensing lubricants in practice today includes the use of 55-gallon drums, semi-bulk and bulk tanks. Transportable semi-bulk tanks hold anywhere from 150 to 550 gallons, and permanent bulk tanks can be as large as the application requires, up to several thousand gallons. The selection of the container size and storage method often depends on the volume of material that is to be consumed annually. In a large percentage of applications, the lubricant container is emptied and refilled without consideration of the contaminants that flow in through the vent and out with the lubricant. Many operations rely on their suppliers to provide returnable drums and semi-bulk containers without considering the cleanliness of the container or checking the cleanliness of the lubricant that is sent back from the supplier facility. One visit to some of the supplier facilities would be sufficient to justify finding an alternative supplier. A large, open facility, such as a power plant, paper mill or steel mill, may have several storage and dispensing areas encompassing a variety of practices. These methods have been deemed acceptable because they work, offering short-term savings compared to engineered storage and distribution systems. Conversely, many companies have converted to modernized storage and dispensing systems and are reaping the financial benefits associated with long-term planning. While many operations still incorporate the use of drums for lubricant storage and dispensing, the practice of storing lubricants in drums presents several problems that increase maintenance costs. Accurate inventory control is almost impossible with drum storage. Drums take up a lot of valuable floor space and, all too frequently, the drum from which a product is retrieved runs dry before the operator has dispensed the desired amount. Best practice is to purchase small volume, infrequently used lubricants in small containers (pints, quarts, gallons, etc. ), preferably in one-shot containers. The frequently used lubricants should be stored in a system designed to dispense the product with the greatest amount of efficiency. A modern, efficiently designed facility will likely employ one of two methods for lubricant storage and dispensing. One method is the utilization of a single centralized storage area. In this approach, the high-volume lubricants that are dispensed in large quantities will be stored in bulk containers, and be dispensed through filters into sealed containers by either gravity feed, or pump (pneumatic or electric). The low-volume lubricants are normally stored in smaller containers, or purchased in container sizes, appropriate to their individual quantities and frequency of use. An alternative method of lubricant storage and dispensing is the strategically located storage area. In a large facility, this method substantially reduces the number of man-hours required to dispense products, compared to that of the single, centralized storage area. Companies concerned with long-term efficiency tend to focus on both large and small ways to reduce cost and improve productivity. The early option for transporting lubricants throughout a facility was the open bucket or oil can. In the absence of dedicated tools, an empty coffee can or plastic milk bottle may suffice to keep a reservoir filled. However, today there are many high-quality alternatives. One manufacturer has created a sealable spout that fits a standardized bottle designed for several different sizes of containers. The spout forms a closeable funnel that drains oil back to the container, preventing airborne contamination as long as the spout is closed after each use. Further, the containers are washable, do not corrode, and do not rust. While the initial purchase cost is slightly more than that of a bucket, the benefits of delivering clean lubricants easily outweigh the costs. Utility carts are used for all kinds of tasks in an industrial complex. Quality control (QC) and chemistry departments take full advantage of them in the fulfillment of daily tasks. The advantages of these carts are low initial cost, abundant space to accommodate the single-quart and 5-gallon containers, funnels, tools, clipboard, rags and other items that the maintenance person requires. The disadvantages are that they handle relatively small quantities of lubricants, do not facilitate filtration, do not reduce the prospect of cross-contamination, and are particularly easy to off-load and commandeer into other purposes. A dedicated mobile lubricant cart optimizes the time of the maintenance person. 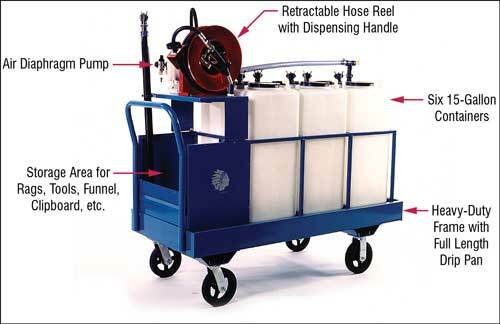 Ergonomics - Well-designed carts include specific storage space for rags, grease guns, tools, etc. Also eliminates the repetitive lifting of containers, such as 5-gallon cans. Speed and efficiency - Carts can be designed to be multifunctional, such as one cart with specific containers dedicated to new and waste oil. Larger capacity reduces trips to centralized storage area. Quality - Carts can be fitted with filtering and metered dispensing handles. Each cart also has its own pump (hand, electric, or air). Some limits on effectiveness for outdoor facilities with various types of ground surfaces. Requires periodic cleaning and minor maintenance. For a facility that has a large footprint, such as a paper or steel mill, there is a tremendous opportunity for labor efficiency improvements through hard piping supply lines directly from the storage area to the equipment. In this approach, the facility designs piping routes to take advantage of the most efficient path from the closest storage area, generally a secondary storage location, and then runs piping directly from the output of the storage bin header to the supply line feed to the equipment sump. 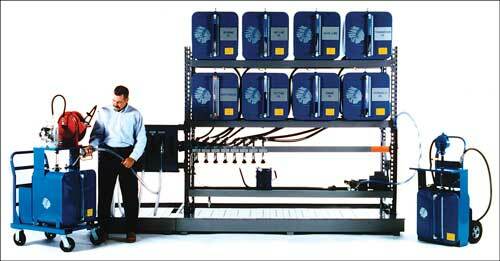 From this state, automation can be achieved by attaching the flow control valves to a level switch at the equipment. If the equipment sump level drops too low, the level indicator opens a valve and allows lubricant to flow. Once the proper level is achieved, the level indicator closes the switch. The benefits of this approach include maximum contamination control, maximum labor efficiency, and the ability to automatically record lubricant volume consumption, document leakage and eliminate incidental cross contamination (assuming that the correct lubricant is placed into the storage tank). The key drawbacks are the high initial capital cost, the loss of valuable maintenance inspection activity and the prospect of run-away product consumption due to in-attention once the route is eliminated. While in the process of upgrading a storage and handling program, don’t overlook the environmental and safety concerns that must be addressed. Effective storage and handling of lubricants includes the knowledge of regulations and safety guidelines for the proper handling of waste oil and hazardous materials. It is important for the environment, employee safety and the future of every business. A spill containment pan is an excellent means of adhering to Environmental Protection Agency (EPA) regulation, 40 CFR 264.175. This regulation stipulates that the capacity of the secondary containment system must be equal to ten percent of the aggregate volume of the containers, or equal to the volume of the largest container, whichever is greater. Any mismatch between the physical requirements of the job and the physical capacity of the worker can result in injuries. Drum cradles (tippers) are frequently used to retrieve oil from 55-gallon drums. A 55-gallon drum of oil can weigh as much as 500 pounds. Even though the drum cradle provides a mechanical advantage for the worker, the process of tilting the drum can often lead to repetitive stress injuries of the back. The same may be said of the repetitive process of pouring lubricants out of 5-gallon containers. The Occupational Safety and Health Administration (OSHA) reports that ergonomic injuries are the nation’s most common and costly occupational problem. Information on injuries and other OSHA issues pertaining to lubricants and worker safety may be found at www.osha.gov. Attention to detail when organizing the lubricant storage and handling practices can provide great secondary dividends. Lubricants are designed to minimize the friction created between moving parts. Unfortunately, lubricant drippings and minor spills are commonly found on the flooring in the areas where oils are transferred or retrieved. A spill containment system built into an organized storage approach can eliminate the housekeeping task and the risk associated with leakage and dripping. A clean working environment minimizes these potential hazards to all plant employees. Lubricants can, under certain circumstances, be characterized as hazardous waste. The Environmental Protection Agency (EPA) has published regulations that address the generation, transportation, treatment, storage and disposal of waste oil, including the conditions that characterize waste oil as hazardous waste. The guidelines note that the lubricant must be practically free of heavy metals and halogens to pass as waste oil. Improper storage of waste oil enables contamination of waste oil with solvents and other hazardous wastes. The cost differential for disposal of waste oil is appreciably less than that of hazardous waste. A well-defined procedure and the proper storage equipment and labeling, and reinforcement of the appropriate policies can reduce the cost associated with handling of waste oil. The greatest disability in life is a bad attitude. If employees responsible for equipment maintenance must struggle with ineffective tools and policies to fulfill their tasks, it will not foster a positive attitude. Conversely, providing equipment, policies and direction that simplify this difficult job will contribute to improved attitudes and job quality, reduced man-hours, and in the end - bottom-line profitability. The companies that have addressed the issue of wasted time as it relates to the storage and handling of lubricants are often the same companies that have realized additional bottom-line profitability. The owner lacking foresight would likely be adverse to the requisition from the plant manager who recommends his company invest in upgraded lubricant storage and handling equipment. But the company CFO who possesses visionary-like eyesight might envision the merits of providing the company with the equipment that maximizes employee work efficiencies. 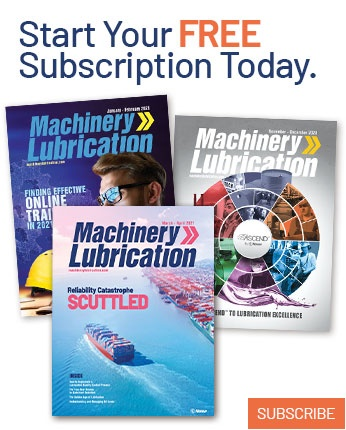 There is an abundance of evidence, both empirical and subjective, which supports the assertion that effective lubrication enhances equipment reliability, and conversely that poor lubrication impedes equipment reliability. Effective lubrication essentially entails correct viscosity or NLGI selection, correct lubricant performance selection for the application, and correct lubrication management techniques. Most manufacturers understand the first and second issues, and will select suppliers that can fulfill these requirements. Often the effort will falter after the first two requirements are fulfilled. The first step of effective lubricant management is contamination control. Without proper storage and delivery of the lubricant, contamination control is likely to be a continuous struggle. It is much less expensive to prevent contamination of lubricants than it is to remove the contaminants after the fact. Proper storage and handling of lubricants is a cornerstone of contamination control. Many lubricant manufacturing companies today are offering preventive maintenance (PM) programs as part of their long-term supply agreements. These PM programs are a great idea, and can represent substantial long-term savings and minimize equipment downtime. But the program itself is not the cure-all. As mentioned earlier, if the maintenance people who have been given the responsibility of implementing the PM program do not have equipment that facilitates the handling of lubricants, the well-designed PM program will often fail to produce up to its potential. Tools that contribute to the success of any PM program must include effective and efficient equipment for storing, delivering and managing plant lubricants. Failure to equip the staff with the right tools will ultimately lead to inefficiency, low productivity and, to the extent that a poor attitude about lubrication influences job performance, a poor quality lubrication program. For more information go to www.ifh-group.com or call 800-435-7003.